Alvar Nunez Cabeza de Vaca was born in the year 1490. He grew up in Cadiz, Spain. His mother, Dona Teresa's surname was Cabeza de Vaca. The title came from the decisive Battle of Las Navas de Tolosa in the Sierra Morenas, on July 12, 1212. While still in his teens, Alvar turned to the military for a career. 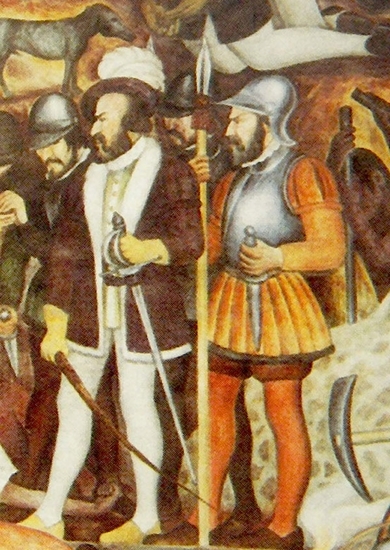 Cabeza de Vaca's military exploits were so well respected that in 1527 he received a royal appointment. Alvar was appointed second in command of an expedition to conquer Florida. The expedition was led by Pamilo De Narvaez, the governor of Cuba. They landed near Sarasota, Florida, on April 14. In the area that we now call Tampa Bay they received information about a tribe called the Apalachen. According to reports the Apalache were rich in gold. Narvaez decided one group of men would travel north by land while the others would travel by sea to a port that had been discovered earlier by Cortes. Cabeza de Vaca strongly protested this idea of separating the ships from the men because they had no interpreter, and they lacked provisions. Nonetheless, Cabeza de Vaca was overruled. Shortly afterward, disaster would strike, the ships would become separated, and no one would ever see the men that traveled by land again. As Cabeza de Vaca and his men were under attack, they soon discovered that the local Timucan Indians had very powerful bows with red oak arrows which could penetrate Spanish armor. One by one the Indians picked off the Spaniards. At this point, they became desperate for food and were forced to turn to cannibalism to survive. The idea of cannibalism shocked the natives. Before long, Narvaez and the men on his ship were dead. Starving and under attack, Cabeza de Vaca and his men made there way into Galveston Bay. There they found abundant food, and friendlier natives. Cabeza de Vaca and his men lived in the area around Galveston Bay, for almost six years. Homesick, Cabeza de Vaca convinced Alonso del Castillo, Andres Dorantes, and a black slave from Morocco named Estevantico, to leave in search of other Christians. The four men made their flight by existing on acorns and prickly cactus. On their way west they encountered one culture after another. Each had its own language and customs. From the very beginning the Native Americans believed that the four unusual men were so unusual that they must be medicine men. Starving, and lacking a better idea, they decided to give faith healing a try. Over and over they gave the sign of the cross and said a few prayers that they knew by heart. Miraculously, people were cured. Before long, people were coming from all of the surrounding villages begging them to cure their ailments. Soon people talked of nothing else. As they traveled cross country they were soon joined by 3,000 to 4,000 of Native Americans who really believed that they could heal. Finally, after 10 years of walking across the entire continent of North America, Cabeza de Vaca, walked into the the town of San Miguel, Culican, Mexico. At first the Spaniards didn't believe that Cabeza de Vaca was one of them. They thought he was an Indian. He was covered in tattoos and piercings, dressed in a loin cloth, and had long unkempt hair. On Sunday July 24, 1537, the four men rode into Mexico City.